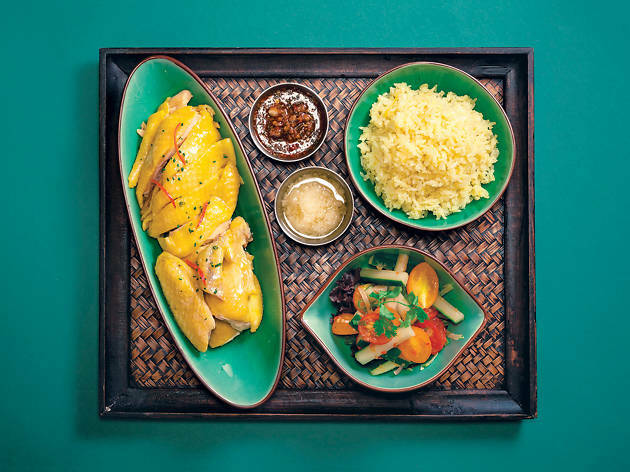 There has been a slew of Thai openings in Hong Kong as of late such as Samsen in Wan Chai and the award-winning Issaya Siamese Club in Causeway Bay. However, if you’re discussing the most popular Thai hangout, then Chachawan is still leading the charge after three years in business. And then there is Mak Mak in the Landmark which is inspiring other dining concepts to delve into the high-end representation of the avours of Siam. So it seems King Parrot Group – the enterprise behind King Ludwig and Coast Seafood and Grill – has been inspired by all this action as it has just opened modern Thai eatery Thaya in Kennedy Town. This is a spacious and sophisticated spot, decked out in teal hues and oxidised brass tones which are accentuated by a mural of lush tropical owers along the back wall. Combined with exposed lament light bulbs, the surrounds are not only stylish but exude a comfortable and relaxed vibe. Taking pride in being a modern Thai eatery, the sizable menu has almost 100 items and that doesn’t even include the drinks. Most of the dishes are under $200 with the exception of the odd item that utilises more expensive ingredients. So we’re actually quite taken aback by the wallet-friendly prices. We start by tucking into one of the more interesting East-meets-West items, the Thai lettuce salad with warm minced pork ($70), but it isn’t that great. Taking inspiration from a larb moo, there’s too much meat in this dish and it’s merely mixed with lettuce instead of the usual medley of herbs. And while a traditional larb moo would be dressed with the likes of citrus and lemongrass, we nd this interpretation only spicy and sweet. Luckily, though, the meal is nothing but stellar from here. Next up, the baked oysters with green curry butter ($128) arrive bubbling and fragrant. A vibrant lime green in colour, the sauce again, deviates from the norm. It’s heavy on the basil rather than the lemongrass like a traditional green curry but it works. The fresh tones of this modi ed curry pair well with the steely taste of oyster and make for an extremely solid starter. with fragrant rice, the generous portion makes for a satisfying course and we thoroughly enjoy this offering. Next up is a tom yum goong seafood spaghetti ($135). Though the combination is by no means avant-garde – there are numerous variations of this around town – the version at Thaya is nevertheless excellent. The sauce could contain a bit more burn but the use of superior seafood makes the dish extremely appetising and a looker too. 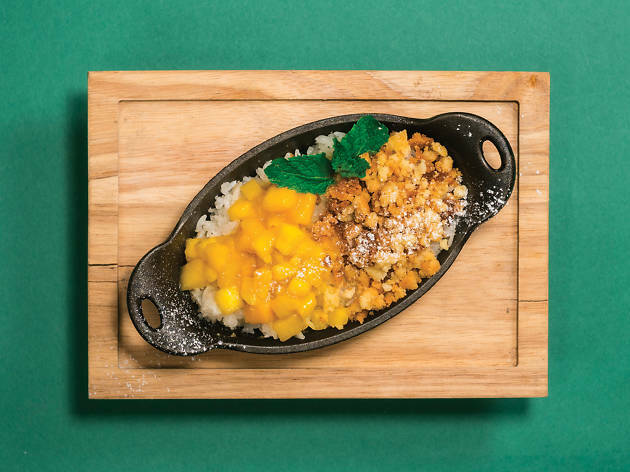 We’re able to end the evening on a high thanks to the coconut mango sticky rice crumble ($65) where, instead of just the usual coconut milk, mango and glutinous rice combo, Thaya throws some biscuit crumble into the mix and the toasty avours work especially well. Overall it’s a top experience at Thaya, and really good value too. Truth is, if we lived in K-Town we’d be hanging out here all the time.